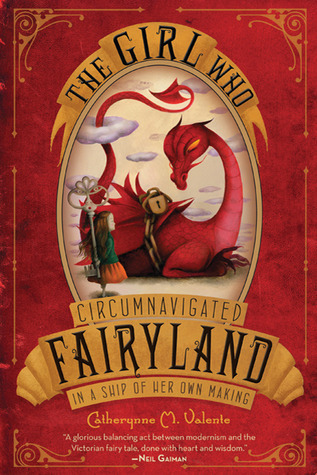 I wish that I hadn’t jumped the gun in writing my “Best reads of 2011” post, since it’s still 2011 and The Girl Who Circumnavigated Fairyland in a Ship of Her Own Making would have definitely been on it. This book reminded me of The Phantom Tollbooth. That is is pretty much the highest praise I can give to a book. Other things that it had touches of: Roald Dahl’s quirky humour, Neil Gaiman’s whimsy and a world that reminded me a bit of The Neverending Story. Catherynne M. Valente is known for her beautiful and evocative prose, and she definitely does not disappoint here. I sometimes find omniscient narrators a little annoying, but Valente makes it charming and delightful. I loved that the story depends so much on September’s conscious choices, rather than her reacting to things that she happens to come across. I thought that was very well conveyed, and made September an captivating protagonist. Summary: irresistible. Go read it now! This is book 2 of 25 of my Dec 11, 2011 book challenge. This entry was posted in Books, Reviews and tagged 2011-12-11-challenge, fantasy, fiction, young adult by Kriti Godey. Bookmark the permalink. I just love the title of this. I’ll have to put it on my must read list.